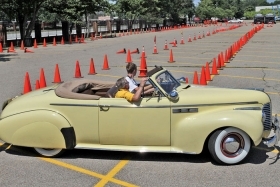 A teenager learns how to drive using a manual transmission at a Hagerty learning course. The thought of manual transmissions fading into history causes McKeel Hagerty to despair. As CEO of Hagerty Insurance Co., a firm that insures about 700,000 antique and collectible autos around the country, Hagerty says he has long been aware that the stick shift is slowly disappearing. "Americans have always leaned toward convenience in driving," Hagerty says, reflecting on his professional knowledge of auto history. "Europeans -- especially the British -- have tended to prefer being more connected to the car and the road. And manual transmissions remain more popular in Europe today." But more alarming, he says, is the realization that -- as a result -- fewer and fewer young Americans are learning to drive sticks. That trend doesn't bode well for a company specializing in antique cars. In response, Hagerty has started a series of free events to allow teenagers to come learn how to drive manuals. He recently matched up his first event with a collector's show outside Detroit, bringing out 30 teens to master the heel-toe dance of clutches and gear shifts. He has already arranged for five more training events around the country next year and wants to increase the number to 20. Caleb Birdsley is one of the teenagers who recently maneuvered a manual-equipped Ford Model A around a Hagerty learning course. Birdsley, a 10th-grader from Allenton, Mich., will have to wait until next April, when he turns 16 and gets his driver's license, to try his technique on real roads. But after that, he says, "I'll probably get a stick shift when I get a car. "My friends in school don't get the shifting thing," he adds, eerily channeling drivers three times his age. "But I like it. I like being in control of the car."